Ciona intestinalis. Credit 'Station Biologique Roscoff / Wilfried Thomas’. New research, led by the University of Southampton, has found that human activities such as shipping are having a noticeable impact on marine species and their native habitats. The research, published in the journal Biology Letters, says that human forms of transport can disrupt natural genetic patterns that have been shaped over long periods of time. This has unknown consequences for both native and invasive species. 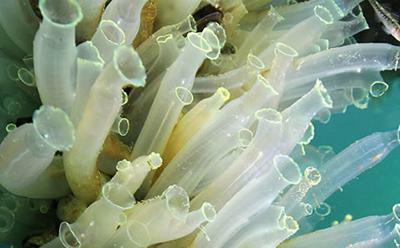 The researchers investigated the genetics of a native marine invertebrate species (the tunicate Ciona intestinalis) in the English Channel, an area with a high prevalence of shipping. Ciona intestinalis has restricted dispersal capabilities and is most often reported in artificial habitats, such as marinas, so are therefore readily transported by human activities. They collected specimens between June and December 2014 from 15 different locations on the English and French coasts. They looked at sections of DNA called microsatellites (areas of DNA that contain repeating sequences of two to five base pairs), which can be read and can help determine how similar populations are to each other. They found a mosaic of genetic patterns that could not be explained by the influence of natural or anthropogenic means alone. Jamie, who is based in the Ecology and Evolution Lab, added: “We found that C. intestinalis from some locations exhibited a shuffling of genetic material, as expected by human-mediated transport (boats can travel further distances than the larvae). However, unexpectedly some of the populations exhibited the opposite pattern (some populations were not genetically similar), despite there being evidence of artificial transport between these locations - this may be due to natural dispersal or premodern population structure. Taken together, the authors found dissimilar patterns of population structure in a highly urbanised region that could not be predicted by artificial transport alone. They conclude that anthropogenic activities alter genetic composition of native ranges, with unknown consequences for species' evolutionary trajectories. The research was conducted by Jamie, under the supervision of Dr Marc Rius from the University of Southampton, and Dr. Frédérique Viard and Charlotte Roby at the Station Biologique de Roscoff, in France. This study was funded by the ANR project HYSEA and the University of Southampton.